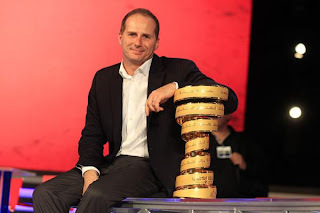 The Giro, like the other two grand tours (Le Tour de France and La Vuelta a Espana) is a massive undertaking - in terms of logistics and publicity. · Athletes: 207 riders from 23 teams (168 started the final stage) and of 30 different nationalities. The first Chinese and the first Greek athletes to participate in the Giro did so this year, and 5 different riders wore the pink jersey. · Sponsors: 29 partners have contributed to the success of the Giro, tying their brand with this legendary edition of the Corsa Rosa. Most of all, Balocco who sponsor the Maglia Rosa, and the other sponsors of the main classifications: Blue – Banca Mediolanum, Red – Italo, White – F.lli Orsero and Estathé – the winner of the stage. · The media: the press office gave accreditation to 1,595 media professionals, including 1,132 journalists and 463 photographers representing 1,076 international, national and local media. The focus was to get into the breaking news on the main news cycle at national and international level. 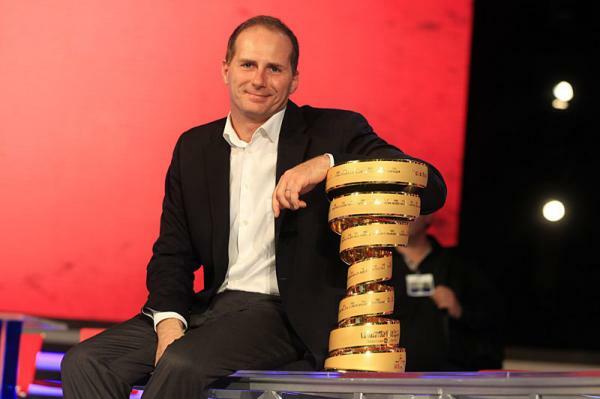 · For the first time the Giro d’Italia was produced in HD, with a great effort by Rai who played the role of Host Broadcaster and allowed the images of the Corsa Rosa to be shown in 174 countries, on five continents. Over the years more and more people around the world are taking an interest in following the exploits of the professional riders as they snake their way round Italy in a quest to secure the coveted pink jersey, fame, glory and a wad of cash. But what of all the behind-the-scenes work? The template for organising this is probably not dissimilar to that for the Tour, the Vuelta and many other high profile international multi-day sports events. However, the organisers of the Giro seem to pull the short straw when they have to deal with that big uncontrollable - the elements. 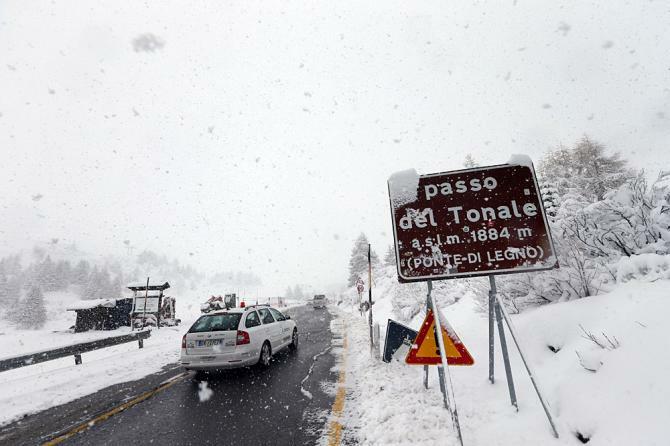 Riding through the high mountains in Italy in May is not that easy. The April showers haven't quite finished and summer hasn't quite started, and there is still quite alot of snow around at altitude. 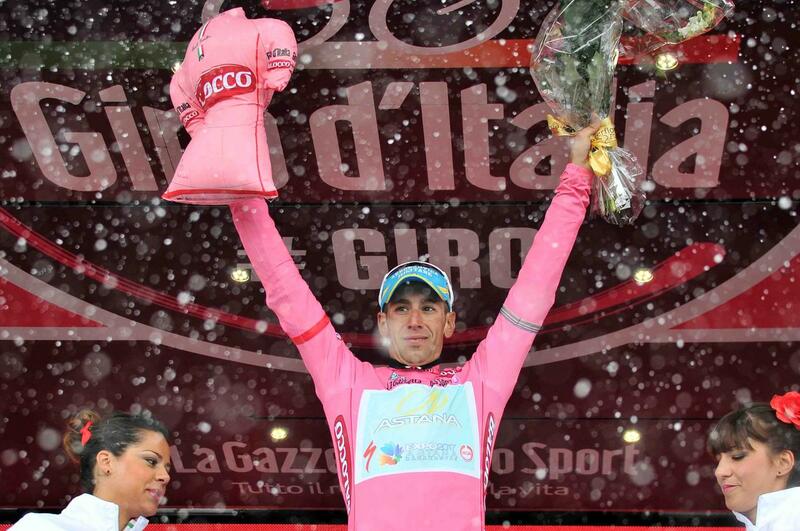 So, bad weather is to be expected during some of the stages - that's part of the challenge of the Giro. However, this year the Giro has come off particularly badly. Even before the Giro began, a number of route changes had to be made owing damage to the roads from floods and landslides. Of the 21 stages, half of them took place in rain, sleet or snow - sometimes accompanied by low cloud, driving wind and freezing temperatures. 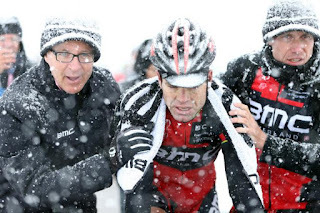 One stage, the eagerly anticipated race that would have gone over the Stelvio and the Gavia Passes didn't take place at all due to heavy snow. Three other stages had to be modified, with riders crossing the finish line of those stages barely able to feel their hands and feet, and barely visible to the spectators through all the mist! The difficulty for the organisers is providing that balance between a good spectacle for the waiting spectators, while ensuring the safety of the riders. On the eve of the stage to col du Galibier discussions took place between Mauro Vegni, the technical director RCS Sport and the Prefect of Savoie, in France. It was only on the morning of the event that a definitive decision could be made, and even then, the situation had to constantly be monitored, ready to alter the route during the race. Then the following week, Vegni and his team were faced with more headaches as they had to decide on a course of action for stages 19 (Ponte di Legno-Val Martello) and 20 (Silandro-Tre Cime di Lavaredo), when faced with atrocious conditions. Attempts were made to save these two key mountain stages - snow ploughs were clearing the passes on the eve of the races. Various technicians actually rode parts of Passo dello Stelvio and Tre Cime to test things out, but to the disappointment of the cycling fans and the riders, stage 19 had to be ditched completely, and stage 20 was re-routed. So with all those last minute considerations, decisions and alterations to be made, Michele Acquarone and his team at RCS Sport did an excellent job in ensuring that spectators, townspeople, sponsors and riders still enjoy a very exciting Giro d'Italia. New in town? Join the cycling club!